As we approach the twentieth anniversary of Disney-MGM Studios/Disney’s Hollywood Studios on May 1st, we are going to continue to take a look back at the days and weeks prior to and around the opening of the park. Today, we’ll peek in on SuperStar Television. 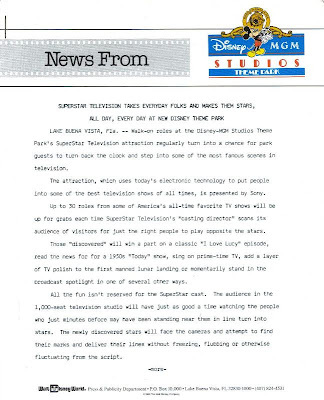 SuperStar Television was an opening day attraction at Disney-MGM Studios, sponsored by Sony, that brought guests onto the sets of classic television programs and, through technological advancements, allowed them to co-star on these television programs. In 1997 the selection of shows used in half hour production were updated in an attempt to bring in more guests, but it was to no avail, and SuperStar Television became a closed set on 26 September 1998. 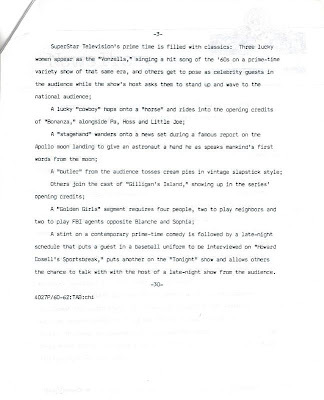 The show was located in the poetically named Superstar Television Theater. After SuperStar Television closed, the theater was used for Doug Live before becoming the home to the new American Idol Experience. 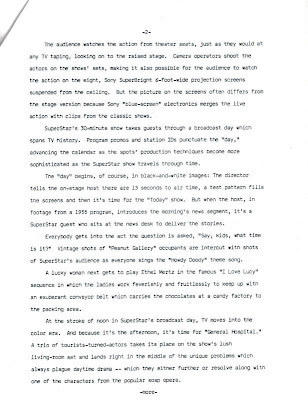 To gain a better understanding at the roles available, and the structure of the program, below is the original press release for SuperStar Television.